Black locust is an interesting tree, commonly seen in the eastern half of the United States and planted throughout the world for its ornamental value and as a source of nectar for bees that create delicious black locust honey. Black locust has durable wood, very resistant to rot and Abraham Lincoln is said to have spent significant amounts of time pondering liberty and equality while splitting black locust for fence posts and rails. As a member of the bean family, black locust has the ability to improve the quality of soil by fixing nitrogen from the atmosphere in its roots. You may recognize this tree as the one with fragrant white blossoms that appear each year in the first week or two in May along our major thoroughfares such as I-95 and at the forest edge in our parks and farmlands. Almost every year about the middle of July many of our locust trees look like they have been assaulted with a blow torch. What manner of devilment is this? The culprit in this attack is a small beetle called the locust leafminer. The locust leafminer belongs to a clan of beetles known as leaf beetles. Well-known leaf beetles include garden pests such as cucumber beetles and Colorado potato beetles. 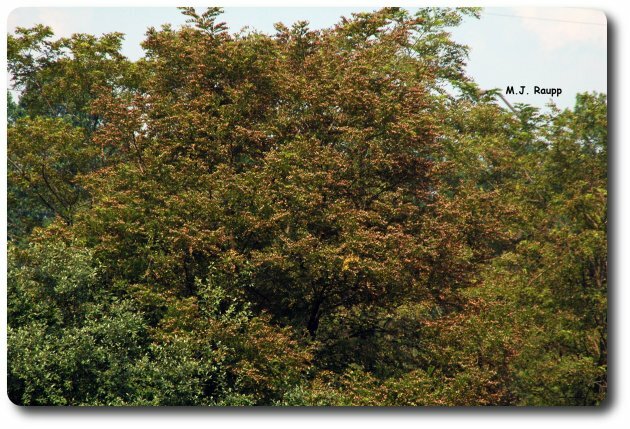 The story of the locust leafminer began back in spring when adult beetles emerged from their overwintering sites on the ground beneath the locust trees. During May and June beetles fly to the treetops to eat the fresh young leaves of locust. Their feeding produces small holes in tender young leaves or rough scrapes on the surface of mature leaves called skeletonization. After dining for many days, they convert the nutritious locust leaves into small batches of eggs laid on the lower surface of the leaves of locust. After the female deposits her brood on the leaf she defecates on them. Now what would Sigmund Freud have to say about that? No matter, this is probably a way to protect the developing larvae within the eggs from becoming a tasty meal for some roving predator. The eggs hatch into tiny larvae that tunnel into the leaf and consume the nutritious tissue between the upper and lower surfaces. In general insects that feed between the surface layers in this fashion are known as leafminers. Leafminers are found in many groups of insects including caterpillars, primitive wasps called sawflies, true flies, and beetles. The leafmining way of life is a clever way to avoid the dangers of occupying the leaf surface where fearsome predators such as lacewing larvae (see A wolf in sheep’s clothing (NEEDS LINK TO APRIL 10, 2006); The lion in my garden, (LINK TO SEPT 12, 2005)), lady beetles (see She’s a lady–or is she? (LINK TO May 23, 2005)), and flower fly larvae (see Who’s your maggot, (LINK TO June 13, 2005)) deal death to plant eaters. 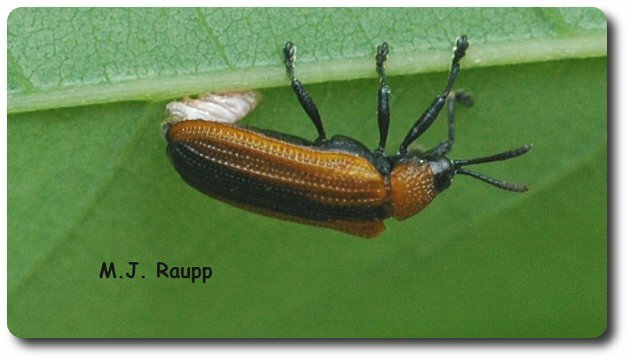 A second generation of locust leafminers begins to eat leaves already attacked by larvae. When larval growth is complete a pupa is formed and within a week or so a new locust leafminer adult emerges and the life story repeats. Two generations of the locust leafminer occur in our region each year. This mining produces large whitish blotches on the leaf that later turn brown as the leaf tissue dies. Large amounts of leafminer damage give the black locust its scorched appearance. Before you feel too badly for the locust, know that the black locust is a very hardy tree capable of standing year after year of the beetle onslaught with seemingly little damage.